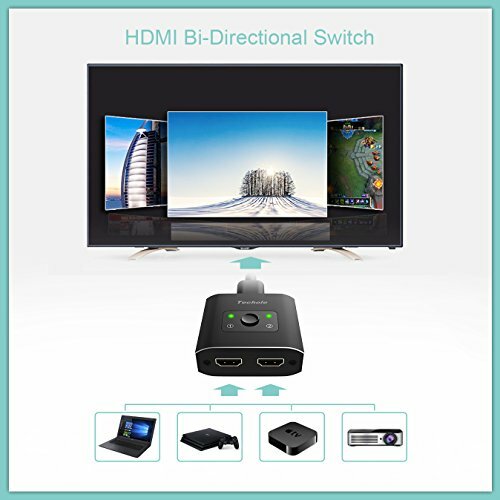 HDMI Switch, Techole HDMI Splitter Bi-direction 2 Input to 2 Into 1 or 1 In 2 Out Manual HDMI Switcher Supports HD 3D 1080P 4K, for HDTV / Blu-Ray/ DVD / DVR player etc. Product prices and availability are accurate as of 2019-04-16 13:17:35 EDT and are subject to change. Any price and availability information displayed on http://www.amazon.com/ at the time of purchase will apply to the purchase of this product. 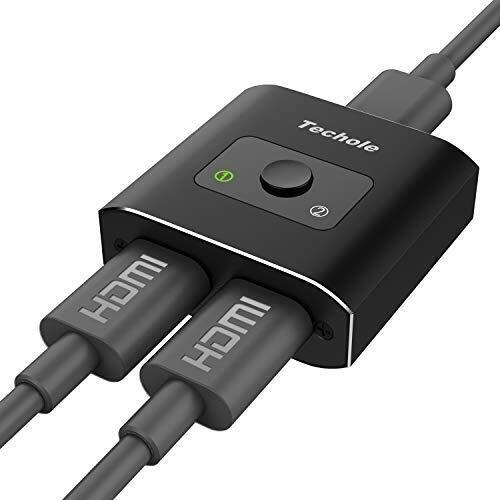 Techole Upgraded HDMI Switch: Bi-Directional Splitter supports connecting 2 HDMI sources to 1 HDMI display, Or 1 HDMI source to toggle between 2 displays ( NOTE: 2 displays can't display at the same time) Support 2 HDMI-Host (DVD Player, PS4 or others) to 1 HDMI Monitor or TV; Or, 1 HDMI-Host(DVD Player, PS4 or others) to 2 HDMI Monitor or TV. High Resolution: Support 3D, 1080P, 4K x 2K resolution and HD audio. Please use a standard HDMI 2.0 Cables to connect your HDMI Source (like XBox, PS4) with Display and HDMI switch, if the resolution of your HDMI Source support 4K (4096*2160) . Long Distance Transmission: The HDMI Switcher provides high bandwidth 3.4Gbps data transmission, Input and output AWG26 HDMI standard cable length could reach up to 5m. Compatibility: suitable for most devices with standard HDMI interface. Input: computer, XBox 360, XBox One, PS3 / PS4 ,Blu-Ray DVD player etc. Output: HD-Ready or Full HD TVs, monitors, projectors etc.